Can ‘Hidden City’ Fares Cut the Cost of Flying? The basic idea of hidden city is simple: On some air routes, the fare from point A to point C is less when you connect through point B than when you fly nonstop. So if you really want to fly to point B, you can cut the cost by buying a connecting ticket from point A to point C via point B and not taking the connecting flight. Here’s a recent example. My friend Don lives in the High Country of North Carolina. Last week, he took Amtrak to Montreal and needed a one-way return flight to Charlotte. The fare for a Montreal-Charlotte flight on US Airways was $353 plus taxes and fees. But on the same day the fare from Montreal to Tampa with a change of planes in Charlotte was just $141 plus taxes and fees. Don bought a ticket to Tampa, flew the first leg nonstop to Charlotte, and just didn’t get on the connecting flight to Tampa. The result: Don paid almost $200 less for his hidden city ticket than for a ticket to Charlotte. Two or three decades ago, hidden city was a big deal. Travel writers regularly reported it as an “insider secret,” kind of a fatuous term considering how many people knew about it. (Parenthetical: A travel publication I once knew carried a subhead “insider secrets you’re not supposed to know,” when, in reality, every “secret” deal the magazine listed was a promotion from some supplier.) Still, before the advent of the big low-cost airlines, hidden city was often useful. Now, however, low-fare competition has greatly reduced the number of places where it can do you any good. Hidden city works only for one-way fights. Had Don wanted to return to Montreal, he might have bought a round-trip Montreal-Tampa ticket for $282 plus taxes and fees. But as soon as he missed that first connecting flight, from Charlotte to Tampa, the airline would have canceled the remainder of his ticket, including the return flights. This is where that recent article got it partially wrong. The story recommended that for a round-trip you should buy two one-way hidden city tickets. But the ploy doesn’t work in reverse: If you buy a one-way Tampa-Montreal ticket but fail to get on the first flight at Tampa, the airline cancels the rest of your ticket and won’t let you get on the Charlotte-Montreal flight. In some cases, you’re better off buying a hidden city ticket one way and paying full price for the return, but a round-trip to or from where you really want to go is often a better deal. 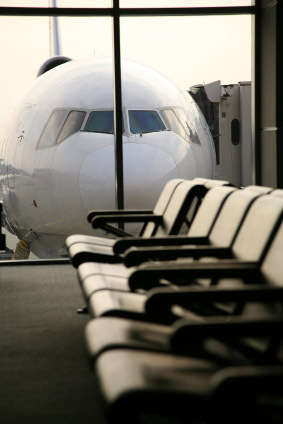 Typically, airlines won’t check baggage just to the connecting point on a connecting itinerary. Obviously, then, because you don’t intend to complete your trip as ticketed, you can’t check any baggage. The risk here is if the gate agent says, “Sorry, the overhead bins are full, so we’ll have to check that carry-on bag.” If you do hidden city, get on the plane early. Hidden city opportunities are generally limited to tickets from an outlying area to a big line’s “fortress hub.” Moreover, the ploy works best when the fortress hub in question has little or no low-fare competition. In Don’s case, Charlotte may be the most tightly controlled of the big-line hubs, and US Airways maintains noncompetitive fares on Charlotte flights. At one time, Atlanta was the prototypical fortress hub, and travelers to Atlanta often used hidden city tickets (or flew to or from Montgomery on Southwest). Since the arrival of AirTran, however, Delta has had to moderate its charges for Atlanta flights. Even so, you may still find hidden city opportunities to Atlanta as well as to such other fortress hubs as Minneapolis, Detroit, Dallas-Ft. Worth, and Houston. To make hidden city work, you also have to find a “beyond” city with low-fare service from your origin city. Because the big lines tend to match those fares, such flights often offer low-fare opportunities. When he was planning his trip, Don tested several other endpoint cities, including Ft. Lauderdale, Miami, and Orlando, but found the Tampa fares were the lowest. Why Tampa? Because it’s a big destination point for Canadian snowbirds, and Canadian low-fare and charter lines such as AirTransat provide lots of cheap flights from Montreal. Transcontinental routes also frequently offer hidden city opportunities, because they’re generally more competitive than routes to or from mid-country fortress hubs. And transatlantic airlines often charge less to fly you through their home base to another European city than they charge just to or from their home base. Throw-away round-trips. At one time, one-way fares were often available only as full-fare coach and were therefore more expensive than the cheapest excursion round-trip fares. So you could cut the costs of a one-way trip by buying a round-trip and throwing away the return ticket. Before the current security regime, you could sometimes even sell the return ticket to somebody willing to travel under your name – airlines didn’t check ID. Now, however, competition from low-fare airlines has forced even the big lines into offering much lower one-way fares, and you only occasionally find routes where a round-trip costs less than a one-way. Back-to-Back. Before the advent of widespread low-fare competition, round-trip tickets without a Saturday-night stay often cost more than twice the price of round-trips with the mandatory stay. Then, you could cut costs of a midweek trip by buying two separate round-trip tickets: the first from your home to your destination, the second departing later the same week from your destination back home. You used the “going” portion of each round-trip ticket to complete one actual round-trip and toss both “return” portions. To avoid detection, goes the standard advice, buy the two round-trips on two different airlines. Lately, however, you don’t find many cases where minimum-stay fares are less than half the fares without this restriction. Nested Flights. With back-to-back tickets, you can ticket the “return” flights for a second round-trip within a 30-day period at no additional cost while still avoiding a minimum stay on both round-trips. If you violate a contract, an airline can theoretically bill you for the trip you actually took, cancel any additional tickets you have, and even nuke your frequent flyer account. As a practical matter, I haven’t seen any such actions by airlines recently, although I remember some airline actions against a traveler whose use of hidden city was “flagrant.” Travel agencies, however, have sometime been billed for the fare difference, so I suggest that unless an agent suggests a hidden city ticket, you not ask any agent to break the rules in that way. Overall, I would book a hidden city ticket without hesitation if I found an opportunity to cut my fare big-time. These days, however, such opportunities are fairly rare.